Tom Oakley experiences disturbing episodes of déjà-vu and believes he is going mad. Then, he discovers that he’s a “Walker” – someone who can transport himself to other times and places. Tom dreams about other “Walkers” in moments of mortal danger: Edward Dyson killed in a battle in 1879; Mary Brown who perished in the Great Fire of London; and Charlie Hawker, a sailor who drowned on a U-boat in 1943. Agreeing to travel back in time and rescue them, Tom has three dangerous adventures, before returning to the present day. But Tom’s troubles have only just begun. He finds that he’s drawn the attention of evil individuals who seek to bend history to their will. Soon, Tom’s family are obliterated from existence and Tom must make a choice between saving them and saving his entire world. Back in June, I was fortunate enough to win a copy of this novel in a giveaway at Confessions of a Bookworm. It sounded like a good story, so was delighted when it finally arrived in the mail. Time travel! Adventure! Saving the world! As it says in the description above, Tom is an eleven-year-old schoolboy when he starts having strange episodes of time playing up. By the time he’s twelve, he’s had several other episodes, thinking he’s going mad when he blurts out History lesson answers in French class and so on, until he’s finally approached by Septimus Mason, who explains that Tom’s not going mad at all – he’s a time traveller. He can “walk” through time and space. So maybe the vivid dreams he’s been having about events in the past aren’t actually dreams …? To learn more about his powers, Tom gets taken to the Hourglass Institute in London, where he finds a professor Neoptolemos who explains the lore for both Tom and the reader, and as Tom is the most powerful walker, like, ever (no surprise there), he’s the best person to try and rescue the three people of whose dying moments he “dreamed”. While learning about his new skillz and rescuing other “Walkers” from futile deaths in the past, he also finds out there’s a tempting Dark Side, hell bent on taking over the world. There’s a parallel world, and somehow, there was an event that sort of locked our world and theirs together, with only a thin dimensional wall of between the two … Can he save our world from the clutches of the other? Tomorrow’s Guardian is a novel for young adults, so it’s a quick and easy read. It’s full of action and adventure, and if you use Nazis as baddies, you can’t really go wrong. Once I reached the end of the novel and saw an excerpt of the sequel, I read that too and am considering getting it. Will await verdict of the Squeeze, who is currently reading it – or is meant to, don’t know if he’s actually started it yet. Because it’s aimed at a younger audience, it lacks a certain depth. It’s a bit like eating Sugar Puffs for breakfast – it kind of fills you up, but you still want something more substantial to eat, and you’re hungry again two hours later. I don’t mind that Tom doesn’t pay any attention to girls – why should he? He’s only twelve – but his emotions feel unconvincing. Tom’s about to risk his life going into the midst of a Zulu battle, into the inferno of a burning building, and risk drowning in a German submarine, but he doesn’t seem to bat an eyelid and just has a “okay, sure, can do” attitude. Until the baddie comes along, of course, because then he’s easily tempted to join them, but changes his mind before anything happens. His whole life gets turned upside down and inside out and this doesn’t seem to faze him much either. Yes, sometimes he gets scared or sad or angry or all of the above, but he seems to just take everything at face value and is fine with that. Neoptolemos, a name that makes me think of Neapolitan ice cream, is basically a rip-off of Albus Dumbledore. But I guess that comes with being a wise, old man who’s acting as a mentor for a boy in secondary school nowadays. Especially boys that hold the key for saving the world. Bordering on Mary-Sue territory, to be The Most Powerful Person Ever, but at least Tom has flaws and isn’t the best at everything in school. Another thing that bugs me is how there is very little personality to go around. Sure, the people that get picked up from history have their own powers and their own ways of talking, but aside from that? I don’t really see them as anything more than plot devices. You’ve got Mary, who keeps calling Tom “Master Tom”, which drives him nuts, and who talks in an old-fashioned way. Other than that, and her special power, she’s no one. Neither are the other two. For that matter, we only get a shallow glance at Septimus as well, and he has the potential. I’m also stuck with a feeling of “don’t I know him?” but maybe that’s just because he’s a fairly generic rogue. Except he’s Welsh. And that’s what I meant about the Sugar Puffs thing. It lacks substance, but that could be down to me being at least twice the age of the intended audience. Nevertheless, it’s still very readable (some irksome formatting errors aside), and very enjoyable. Kudos to Denning for explaining some very complex bits about time travel and making it understandable. He covers all bases I could think of while reading it, so difficult to poke any holes in it – which is really well done. The bits I think I prefer most of all, though, were the visits to historical events. Denning clearly knows his stuff, and manages to set the scenes very well. It’s particularly in these parts where the book excels. The most surprising thing I found out after finishing the book is that Richard Denning is one of the organisers of the annual UK Games Expo in Birmingham, which we have gone to for the past three years! And what’s more, he’s the creator of the board game I playtested last year, based on the Great Fire of London! Small world. While I’m on the subject, I enjoyed playing it; it’s a good game, well worth playing. 🙂 Another interesting thing is that he was born in Ilkeston, which is quite literally ten minutes down the road from us. Overall, Tomorrow’s Guardian is an enjoyable book that takes you for a wild ride through time, space and parallel dimensions. Also: Nazis make the best villains. 3.8 out of 5 grandfather clocks, because it’s a good story and I actually feel like reading the rest of the trilogy. 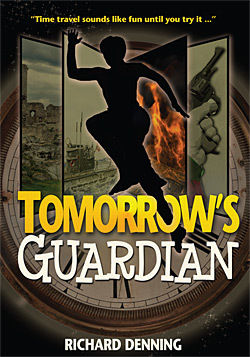 Tomorrow’s Guardian is the first book of The Hourglass Institute trilogy. Book two, Yesterday’s Treasures came out this year, and book three, Today’s Sacrifice, is set to be released in the spring (2012). 2 Responses to "Tomorrow’s Guardian by Richard Denning (2010)"
Yes, it sure seems that way! 🙂 Everyone who’s into history is likely to have a favourite era or event in history, and his is the Great Fire. Can’t decide what mine is. What’s yours?